Extreme haze caused by forest and bush fires throughout Sumatra and Kalimantan, Indonesia has been a perpetual problem affecting the quality of life and economy of local residents and neighboring countries. As this year’s dry season approaches, the fires are just starting to pick up, especially in the fire-prone province of Riau, Sumatra. They’re already threatening some of the most biodiverse and carbon-rich ecosystems in the country—protected forests and peatlands. According to NASA’s Active Fire Data on the Global Forest Watch Fires platform, half of the fire alerts in Riau Province1 are occurring in protected areas or those where new development is prohibited under Indonesia’s national forest moratorium. 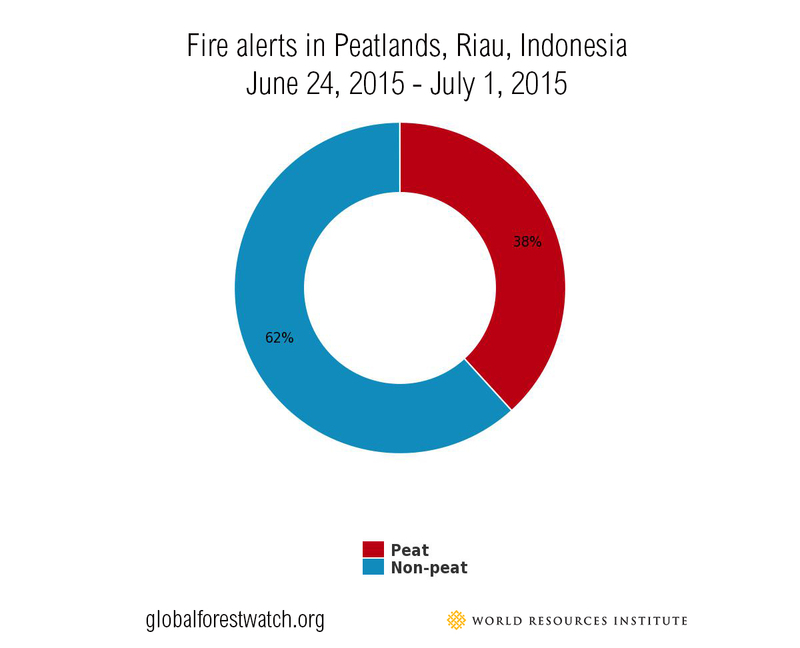 And an alarming 38 percent of Riau’s fire alerts are on carbon-rich peatlands, releasing greenhouse gases into the atmosphere and fueling global climate change. And that’s not all the GFW Fires platform shows—here’s a rundown of what we also know about the start of this year’s fire season. During 2013-2014, fires in Indonesia caused a haze crisis in Sumatra, Malaysia and Singapore, sparking a call for greater accountability from companies and the Indonesia government, and resulting in Indonesia signing the ASEAN Agreement on Trans-boundary Haze Pollution. 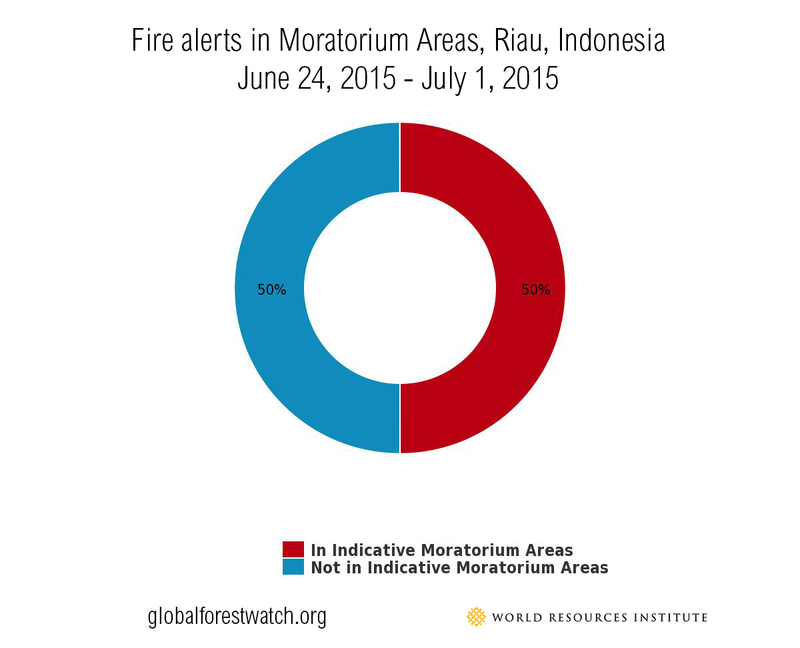 With the dry season just starting in Sumatra, we are just beginning to see fire alerts increase. WRI will watch the situation closely over the coming months to see whether Indonesia’s commitment to reducing fires and haze pollution will be met. 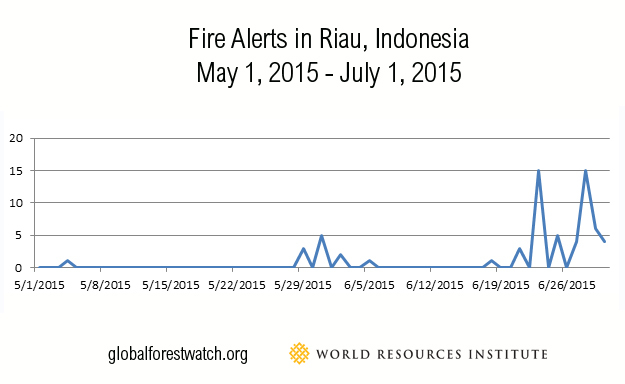 As was the case last year, the greatest concentration of fire alerts are in the Riau Province of Sumatra. Riau Province also has the highest concentration of land under oil palm cultivation in the country, accounting for 25 percent of national production. In Riau, fire has long been used as a fast and inexpensive way to clear land and prepare it for planting. Research from CIFOR indicates that determining the exact cause of the fires is complex, as fires often occur outside of concession boundaries or in concession areas operated by smallholder farmers. A large number of fire alerts are concentrated in Tesso Nilo National Park, which has been significantly damaged by illegal encroachment in recent years. The approximately 83,000-hectare (205,000-acre) national park lost more than half of its tree cover from 2001-2013, according to GFW data. The park is habitat for critically endangered Sumatran elephants and tigers. 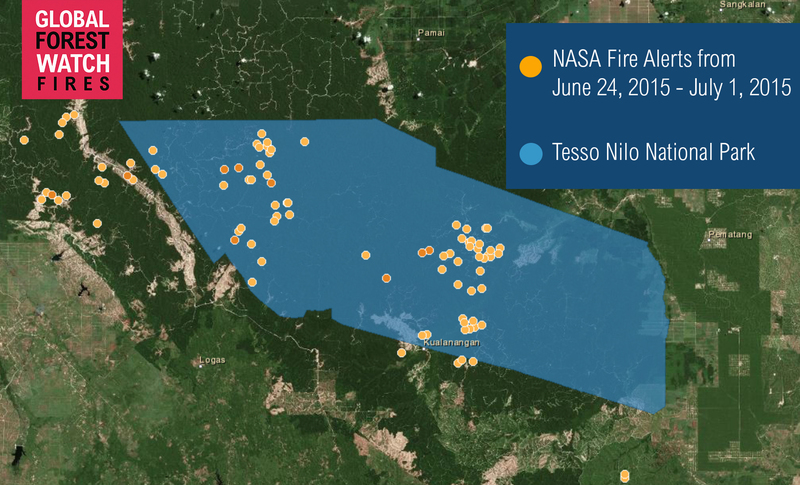 In the last week, 69 fire alerts were detected in Tesso Nilo, of which seven were high-confidence alerts likely to be associated with forest clearing. Other fire alerts that do not meet the high confidence fire criteria are still likely to be fires, but more likely associated with burning fields/grass or other conditions that result in lower-temperature fires. Click to view on the GFW Fires platform. While we have yet to see a major spike in fire alerts in Riau, where the alerts are located thus far reveals regulatory and enforcement weaknesses. As part of the national forest moratorium, President Susilo Bambang Yudhoyono prohibited the issuance of new development licenses in key forest areas, a commitment extended this year by current President Joko Widodo. It’s clear that this regulation isn’t being properly enforced. Likewise, many loopholes in the moratorium, such as allowing for the clearing of moratorium areas for food and energy crop development, have been widely criticized. Inadequate oversight of protected areas is also a pervasive problem in Indonesia, and has been particularly devastating to Tesso Nilo. Forest Management Units, governed by the Ministry of Environment and Forestry, often do not have the capacity or resources to prevent encroachment of agriculture and other forest users. Swift action from the president and Minister of Environment and Forestry Siti Nurbaya could make a significant difference in the outcome of the fire season in Riau this year. They should strengthen the protections under the moratorium. Now is also a good time for President Jokowi to revisit his November 2014 promise to review all permits issued on Riau’s peatland, and terminate those found to be damaging the ecosystem. You, too, can help monitor the fires in Riau and elsewhere in Indonesia this year. 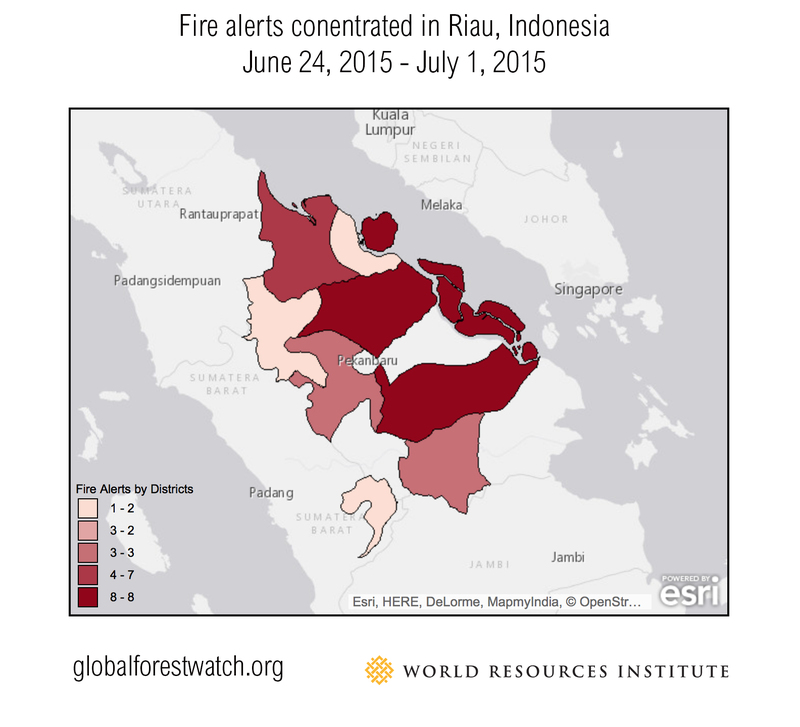 Go to GFW Fires, look for fire alerts in Riau and tweet them using #EyesOnRiau. Click on the “sign up for alerts” button in the upper right corner of the map to get automatic email or SMS notifications of fire alerts in specific areas. WRI used NASA’s Active Fire Data to determine the likely location of fires on the ground. This system uses the NASA MODIS satellites that survey the entire earth every 1-2 days. The sensors on these satellites detect the heat signatures of fires within the infrared spectral band. When the satellite imagery is processed, an algorithm searches for fire-like signatures. When a fire is detected, the system indicates the 1 km2 where the fire occurred with an “alert.” The system will nearly always detect fires of 1,000 m2 in size, but under ideal conditions, can detect flaming fires as small as 50 m2. Since each satellite passes over the equator twice a day, these alerts can be provided in near-real time. Fire alerts are posted on the NASA FIRMS website within 3 hours of detection by the satellite. The accuracy of fire detection has improved greatly since fire detection systems were first developed for the MODIS satellites. Today, the rate of false positives is 1/10 to 1/1000 what it was under earlier systems first developed in the early 2000s. The algorithm used to detect fires includes steps to eliminate sources of false positives from sun glint, water glint, hot desert environments and others. When the system does not have enough information to detect a fire conclusively, the fire alert is discarded. In general, night observations have higher accuracy than daytime observations. Desert ecosystems have the highest rate of false positives. Many papers have been published to validate the NASA MODIS active fire alerts for use in various applications. WRI is employing a recommendation for detecting forest clearing fires (described in Morton and Defries, 2008), identifying fires with a Brightness value ≥330 Kelvin and a Confidence value ≥ 30% to indicate fires that have a high confidence for being forest-clearing fires. Low confidence fires are lower intensity fires that could either be from non-forest-clearing fire activity (clearing fields or grass burning), or could be older fires that have decreased in intensity (smoldering rather than flaming fires). The use of this classification establishes a higher standard for fire detection than using all fire alerts equally. NASA FIRMS FAQ Morton, D., R. DeFries, J. T. Randerson, L. Giglio, W. Schroeder, and G. van der Werf. 2008. Agricultural intensification increases deforestation fire activity in Amazonia. Global Change Biology 14:2262-2276. After Record-Breaking Fires, Can Indonesia’s New Policies Turn Down the Heat?